If you're planning to visit Chicago during the wintertime, try to make a little time for ice skating. The Ice Rink at Daley Bicentennial Plaza offers a skating experience you can't get anywhere else in the world. You can enjoy the sights of downtown Chicago while getting some exercise skating at this rink. If you or someone you're visiting with would prefer not to skate, you needn't worry. There is plenty to enjoy in the area around Daley Bicentennial Plaza while simply walking around and sipping some hot chocolate, and watching others skate can be very fun. 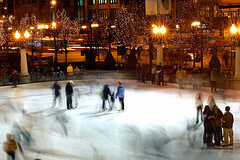 The ice rink is one of the many things that makes Chicago a truly special city. Before or after skating, you can visit the Art Institute of Chicago, and the nearby (it's really the other side of South Columbus Drive) Millennium Park. If the rink is too busy, visit the nearby McCormick Tribune ice rink. The address is 337 Upper Randolph Drive, Chicago, IL, United States‎. Last updated by Marianne on 17 February, 2010 in Destinations.